A top North Wales ‘green’ energy company are in the running for a hat-trick of national awards. Hafod Renewables, from Denbigh, have been short-listed in three categories at the Wales Energy Efficiency Awards at Cardiff’s Marriott Hotel this month. 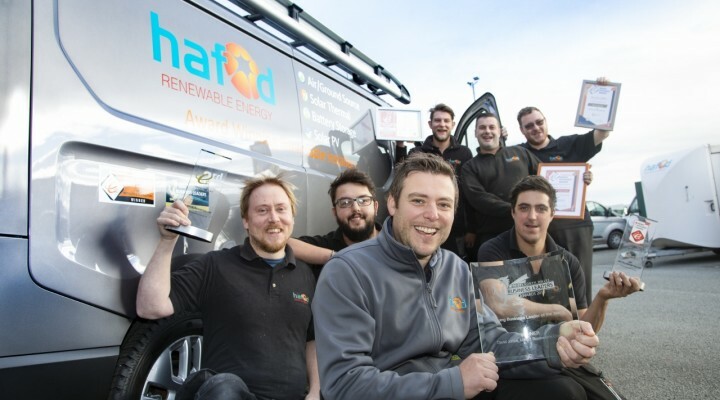 It follows their success last year when they were voted Wales’s top Renewable Heating Installer and followed that up by being named in the top three in the UK. This year they are again in the running for the RHI award, which covers non-solar energy systems including air and ground-source heating and biomass, and are also in the final lists for Solar Installer of the Year and Small-Scale Project for the ground-source system they installed at an egg farm in Conwy last year. It is a continued story of success for the family firm founded by Managing Director David Jones and his father, Richard, in 2010 and which now employs nine staff and turned over £1.5 million in the last financial year. Hafod Renewables has become a key player in North Wales and the border counties in the installation of both solar and non-solar systems and David Jones said: “We’re delighted to be up for three awards in Wales this year. “It’s a testimony to the expertise and hard work of our staff because this is a very competitive sector as solar power has become ever more popular as a domestic energy source. “Our success has depended on us being versatile and very customer focused as well as by only using our own dedicated and highly-trained teams of installers. The government tariffs for solar power are due to end by April and although this has prompted a rush of customers David Jones is confident that solar will continue to be popular. The former Holywell High School pupil, a graduate in renewable technology, said: “Solar power can now hold its own against oil, gas and conventional electric competitors. “Advances in the technology of solar panels which has made them more efficient at the same time as they have become cheaper and a revolution in battery technology have altered the landscape. Solar installations currently make up slightly more than half of their work but RHI systems, like the ground-source heating installed for a 16,000-hen egg farm near Llanfihangel Glyn Myfyr, remain popular. The business are also approved partners with renewable industry giants such as Daikin, Mitsubishi and Tesla. David added: “The UK recently saw a third of its power produced by renewable sources– who would have believed that was possible even five years ago. This entry was posted in Business, Environment, Featured, News, technology. Bookmark the permalink.